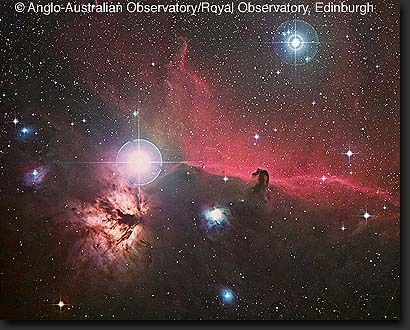 Explanation: The Horsehead Nebula is one of the most famous nebulae on the sky. It is visible as the black indentation to the red emission nebula seen just to the right of center of the above photograph. The bright star near the center is located in the belt of the familiar constellation of Orion. 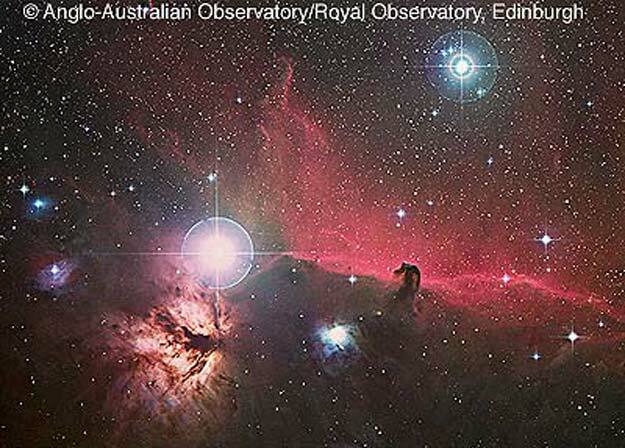 The horse-head feature is dark because it is really an opaque dust cloud which lies in front of the bright red emission nebula. Like clouds in Earth's atmosphere, this cosmic cloud has assumed a recognizable shape by chance. After many thousands of years, the internal motions of the cloud will alter its appearance. The emission nebula's red color is caused by electrons recombining with protons to form hydrogen atoms. Also visible in the picture are blue reflection nebulae, which preferentially reflect the blue light from nearby stars.